That was in 2009. Today, social media has transformed the way we do sales, marketing and public relations – yet there are still many misconceptions about social media. We’ve rounded up nine common myths and research to debunk them. Whilst Facebook, Twitter and LinkedIn definitely top the list of social networking sites, there are many less popular forms of social networks out there. These can include collaborative projects such as Wikipedia, microblogs such as Tumblr and content communities such as YouTube and Dailymotion. Enterprise collaboration tools such as Sharepoint and Yammer also count as social media. All of these sites have their own unique audiences and require various strategies to successfully engage with fans. We’ve all heard stories about students who get distracted from studying due to Facebook and use it as a method of procrastination; so much so that people had to intentionally deactivate their Facebook accounts during exam periods so they could concentrate. However, this dip in productivity does not necessarily hold true for the workplace. Ipsos and Microsoft surveyed roughly 10,000 information workers across 32 countries and found that 46 percent of workers said their productivity had greatly or somewhat increased because of social media use in the office. In this case, social media encompassed instant messaging, text messaging, video conferencing, news feeds, social networks and team sites such as SharePoint. In the same Ipsos and Microsoft study, 34 percent of workers indicated that management underestimated the benefits of social media tools, and 37 percent said that they could do their job better if the organization’s management was on-board with the use of social tools in the workplace. Furthermore, a study by McKinsey stated that certain industries like consumer packaged goods, retail financial services, advanced manufacturing and professional services could raise productivity by 20 to 25 percent if companies fully implemented social technologies which help improve collaboration and communication within and across enterprises. As there are no barriers to applying for jobs via social media, the quality of candidates naturally varies. It’s easy to believe that the average quality of applications would indeed be lower than if a company went through a recruitment agency which targets the profiles of candidates of a certain caliber. Jobvite’s social recruiting survey 2013 results found that the highest-rated candidates are sourced through referrals, followed by social networks. A study by big data firm Evolve looked at call center staff in the US with a sample size of approximately 40,000 and found that employees who used one to four social networking sites on a weekly basis stayed at their jobs longer than their peers. Furthermore, in a second experiment with a sample size of 4,991, staff who regularly used more than five social networks demonstrated higher sales in less time than their colleagues who didn’t. A study by Capgemini Consulting and MIT found that training in social media and all things digital is a deciding factor in why digitally-intense companies outperform their less Web-savvy counterparts financially. The report stated that “companies with stronger digital intensity derive more revenue from their physical assets.” They also generate more revenue per employee, have higher net profit margins and higher market valuations. In 2009, Dell made $3 million in sales from just one of its Twitter accounts. This account also had a history of listening to fans, and excellent consumer engagement. If a brand is able to build a following of consumer advocates and listen to the concerns of its target audience, it might be able to get away with slightly pushing products via social channels. Still, brands need to approach social media as a chance to foster an online consumer base rather than just another sales medium if they want to gain these other benefits. As long as the team remains genuine, and only mention its product in moderation, they can offer helpful tools for consumers instead of overload them with annoying sales pitches. Social news aggregators like Digg, StumbleUpon and Reddit are still popular—and relevant. With the advent of social news feeds on Facebook, Twitter and LinkedIn, one might think that they’ve replaced the social news aggregators. However, Statcounter’s global stats for social media show that people are still quite active on StumbleUpon and Reddit. Both sites have had higher average traffic than YouTube for the past year. 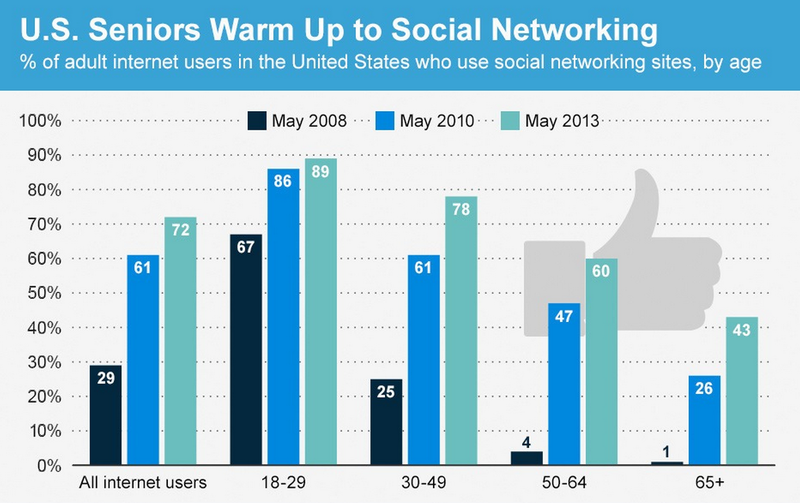 The Pew Research Center found that in 2013, 43 percent of Americans over 65 used at least one social networking site, compared with 26 percent in 2010 and 1 percent in 2008. At time of publication, there are 39 million people aged 65 and older using Facebook, Twitter and Skype, making them the fastest growing age demographic on these sites. Don’t underestimate this power generation!